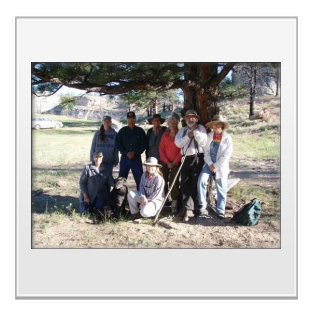 On July 11, 2010, eight volunteers from five states came to Outlaw Campground to participate in the Buffalo Field Office's first Passport in Time (PIT) project. 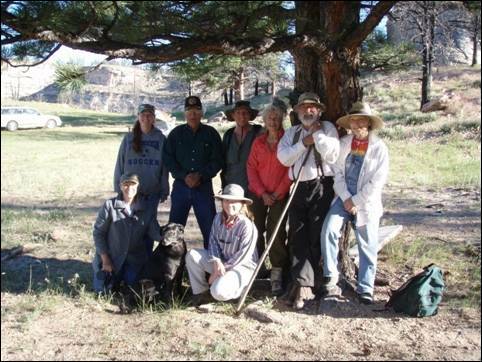 While updating previously recorded sites, recording new sites, and surveying for rock art in the Middle Fork Recreation Area, volunteers contributed a total of 320 hours! Four days were spent at the Middle Fork Recreation Area on the south side of Middle Fork Canyon, and one day was spent recording on Buffalo Creek in the southern portion of the Field Office boundaries. 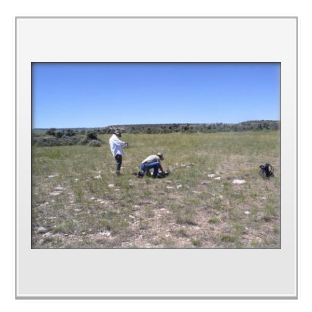 Volunteers revisited several sites, which included three rockshelters, one lithic scatter with rock art, and one lithic scatter with possible stone circles. Newly recorded sites included two rockshelters, two rock art sites, one lithic scatter, and one open camp that contained a total of 16 stone circles. Volunteers created a plan view map of each rockshelter, along with an artifact inventory, and a spatial point for each was logged using a Trimble Geo XT unit. The lithic scatters were also mapped using the Trimble Geo XT unit. Additionally, all debitage was analyzed and all tools were point plotted, photographed, and measured. 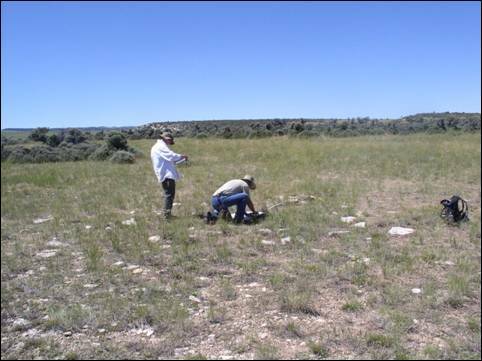 At one site, volunteers excavated a shovel test site to assess the potential of subsurface deposits. Volunteers learned to identify debitage, identify and describe stone tools, and produce plan-view maps of rockshelters and stone circles. They also were given instruction on site ethics and about the importance of the archaeological record. We found very little prehistoric rock art. 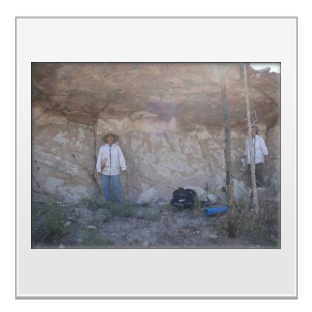 One previously recorded site form noted two prehistoric rock art motifs, but we were only able to locate one. This panel was logged and photographed. Two new localities included "art" in the form of tool grooves and modern graffiti. However, one of these had been heavily damaged by the Outlaw Fire of 2006 and very little rock art remained. 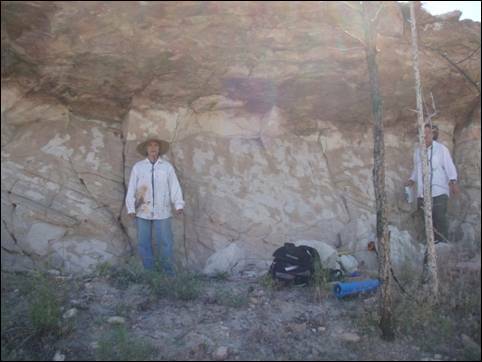 The other was named "Tool Groove Shelter" and, as the name might suggest, contained hundreds of tool grooves, some prehistoric and some likely historic (including the aforementioned modern graffiti). Two volunteers, both artists, took the time to draw the rock art remaining in the BFO's only interpretive site, the Sweem-Taylor rock shelter. These drawings can be compared to previous photographs and drawings to track vandalism and deterioration of the site. One of the previously recorded sites on our agenda had been reported in 1987 to contain two, possibly three, stone circles. We visited this site on the last day of the project, but the stone circles were gone the stones had apparently been incorporated into two modern fire pits! 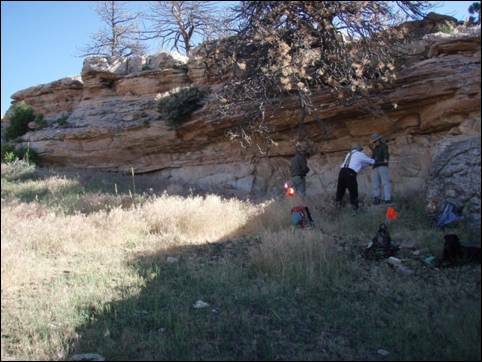 Also on the last day, we located one additional rockshelter. Because of time constraints, it was not fully recorded, but will potentially become part of the Middle Fork Site Recoding II project. 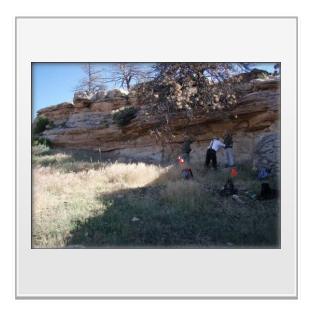 By the end of the week, this incredibly hard working group of volunteers had updated or revisited six sites, identified and recorded six new sites, and surveyed approximately two miles of sandstone exposures for rock art! This important work will allow the BLM to determine eligibility for the National Register of Historic Places and establish a management plan for the important resources of this area.